Subcompact crossovers offer our Saginaw area buyers the roominess of a crossover and the efficiency of a sedan. 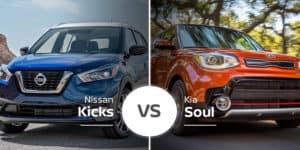 At Garber Nissan Hyundai serving the Bay City area, we have two great options in this segment in the 2019 Nissan Kicks and the 2019 Nissan Rogue Sport. Which one is the better option for your family? Continue reading to find out. Having debuted just a year ago, the Kicks is one of the newest models in Nissan’s lineup. While it is not as polarizing as its predecessor, the Nissan Juke, it grabs eyeballs with its stubby nose, forward-leaning rear hatch, floating roof, sharp body lines, black body cladding, and Nissan’s signature boomerang-like lighting. The 2019 Nissan Rogue Sport is the less extroverted subcompact crossover in the brand’s lineup. It carries on the traditional crossover look that is sure to draw in more buyers than the Kicks. It’s not that the Kicks is a bad-looking vehicle; it’s purely a numbers game that shows a more traditional styling attracts a wider range of buyers, especially in the more mainstream crossover segment. The 2019 Nissan Kicks and 2019 Nissan Rogue Sport both have lots of exterior look-good bits to draw in buyers. The smaller Kicks has available LED lighting, 17-inch alloy wheels, dark-chrome accents, and more. 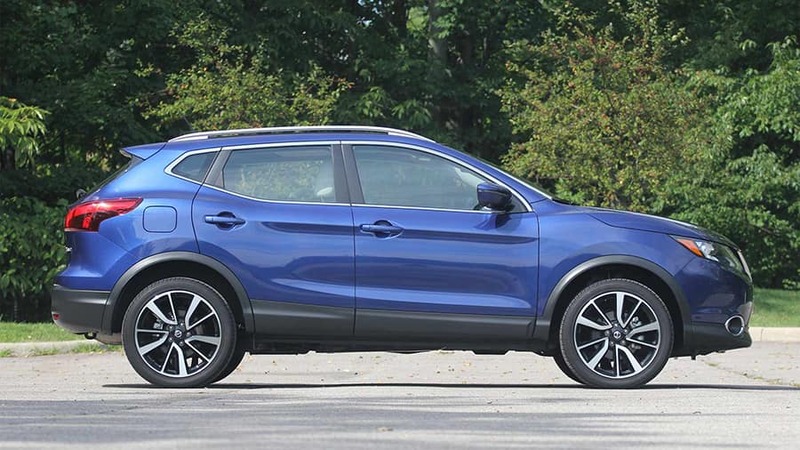 The 2019 Rogue Sport also has plenty of sharp visual options, including LED daytime running lights, 19-inch wheels, LED mirror-integrated turn signals, and more. 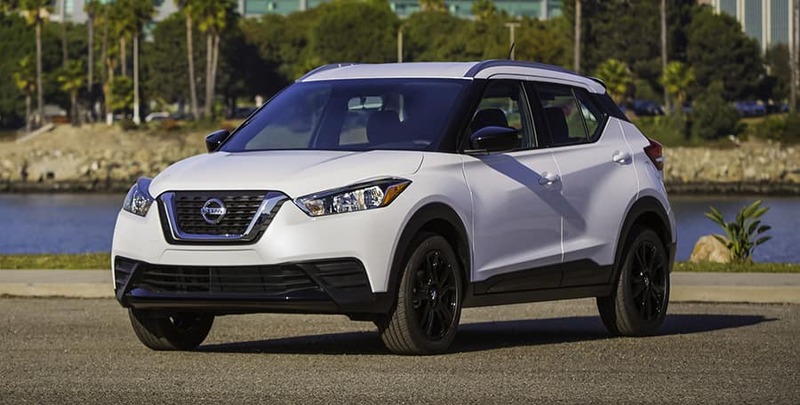 As the higher-level small crossover in Nissan’s crossover lineup, the 2019 Rogue Sport is larger than the Kicks in every measurable, especially length and width. This gives the Rogue Sport more space for passengers and cargo, but it makes it harder to park and significantly heavier. The wild exterior the Nissan Kick features does not transfer into the cabin directly, but it does have a sporty design that includes a flat-bottom steering wheel, bolstered seats, circular air vents, and available contrast stitching. Inside, the 2019 Nissan Rogue boasts the same flat-bottom steering wheel as the Nissan Kicks, but that is about as far as its sporty features go. The rest of its interior is precisely what you’d expect from a subcompact crossover. While this may not be overly exciting, it is perfect for buyers who prefer simplicity. 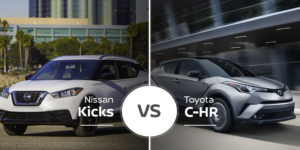 Both crossovers offer tons of interior features tuned toward younger buyers. 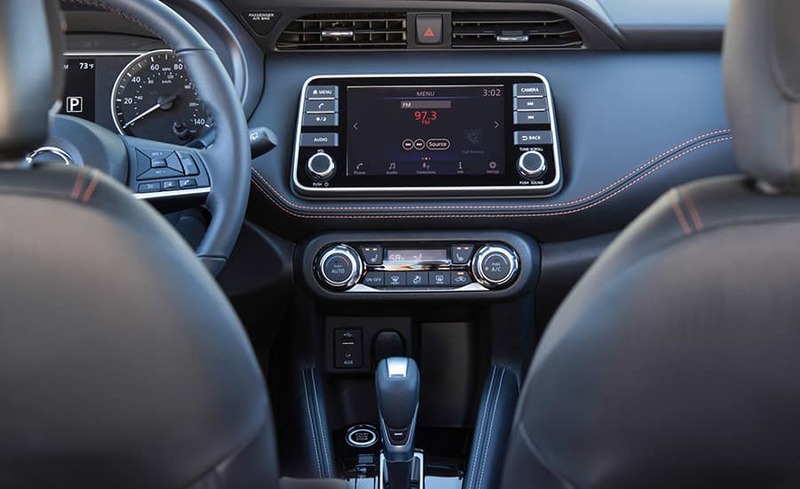 Standard features in the Kicks and Rogue Sport include a 7-inch touchscreen, Siri Eyes Free, Bluetooth audio streaming, a six-speaker audio system, and USB ports. Where the Rogue Sport shows its more mature side is in its range-topping SL trim, which includes standard ProPilot semi-autonomous driving, a nine-speaker Bose audio system, and more. Despite being the smaller of the two crossover, the 2019 Nissan Kicks has more headroom and legroom in the front and rear, and rear hip room. The Rogue Sport wins big time in every other seating measurement. In the cargo area, the Kicks has a ton more space with the rear seats upright, but the Rogue Sport’s larger body offers up to an extra 8 cubes with the seats folded. 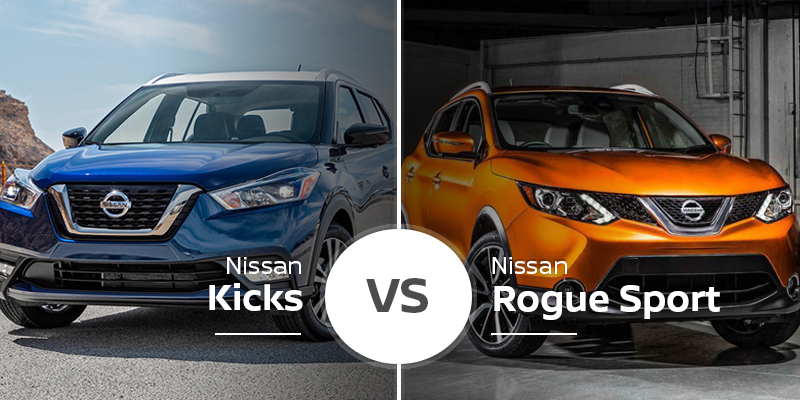 Small crossovers are rarely great performers, and the Nissan Kicks and Nissan Rogue Sport are about as typical as it comes in this area. The 2019 Nissan Kicks comes standard with a 122-horsepower 1.6-liter engine that sprints it to 60 mph in an estimated 9.7 seconds. Despite having 19 horsepower less than the Rogue Sport, the Kicks is quicker to 60 mph than the Rogue Sport by 0.3 seconds. This extra straight-line speed is thanks to the over 600 pounds of weight savings the Kicks offers. The 2019 Nissan Kicks is the better buy for those looking to stand out. Beyond its eye-grabbing looks and sporty cabin, the 2019 Kicks also delivers slightly better straight-line speed, making it a great option for the younger crowd. Plus. with its larger cargo area with the rear seats up, the Kicks can haul people and cargo with the best of them while delivering far superior fuel economy. Who Should Buy the 2019 Nissan Rogue Sport? The 2019 Rogue Sport is great for more established buyers who do not want wild styling or need quick acceleration. Its traditional looks also attract more forgiving eyes than the Kicks. Finally, buyers in cooler climates with ice and snow will appreciate the Rogue Sport’s available all-wheel drive. Whether you have a daily commute to Saginaw or just take weekend trips to Bay City, the 2019 Nissan Kicks and 2019 Nissan Rogue Sport can get it done with style and efficiency. 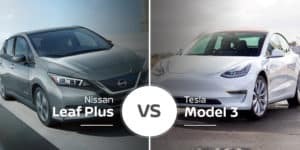 Head to Garber Nissan Hyundai serving the Midland area and test drive both these small crossovers to see which is better for you. Can’t make it into our Saginaw area showroom today? Navigate to our online inventory page to see what 2019 Kicks and 2019 Rogue Sport models we have in stock and schedule to test drive a few at your convenience.